Monday, December 3, 3-5 p.m.
Childhood trauma and toxic stress can have a profound impact on the health and development of children throughout their life. Take a closer look at this issue at a screening of the documentary Resilience, hosted by Literacy 2030, Richland Library, and the South Carolina State Library. After the film, there will be an opportunity to discuss the issue in our community and how we can help our children build resilience. The original research was controversial, but the findings revealed the most important public health findings of a generation. 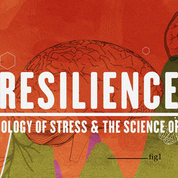 RESILIENCE is a one-hour documentary that delves into the science of Adverse Childhood Experiences (ACEs) and the birth of a new movement to treat and prevent Toxic Stress. Now understood to be one of the leading causes of everything from heart disease and cancer to substance abuse and depression, extremely stressful experiences in childhood can alter brain development and have lifelong effects on health and behavior. However, as experts and practitioners profiled in RESILIENCE are proving, what’s predictable is preventable. These physicians, educators, social workers and communities are daring to talk about the effects of divorce, abuse and neglect. And they’re using cutting edge science to help the next generation break the cycles of adversity and disease.